Melania Trump (/məˈlɑːniə/; born Melanija Knavs; [mɛˈlaːnija ˈknaːu̯s], Germanized to Melania Knauss; born April 26, 1970) is the current First Lady of the United States and wife of the 45th U.S. President Donald Trump. She was born in Novo Mesto, and grew up in Sevnica, in the Lower Sava Valley, SR Slovenia. She worked as a fashion model for agencies in Milan and Paris, later moving to New York City in 1996. Her modeling career was associated with Irene Marie Models and Trump Model Management. And so she has proven to be! A beautiful and gracious First Lady with style and taste. 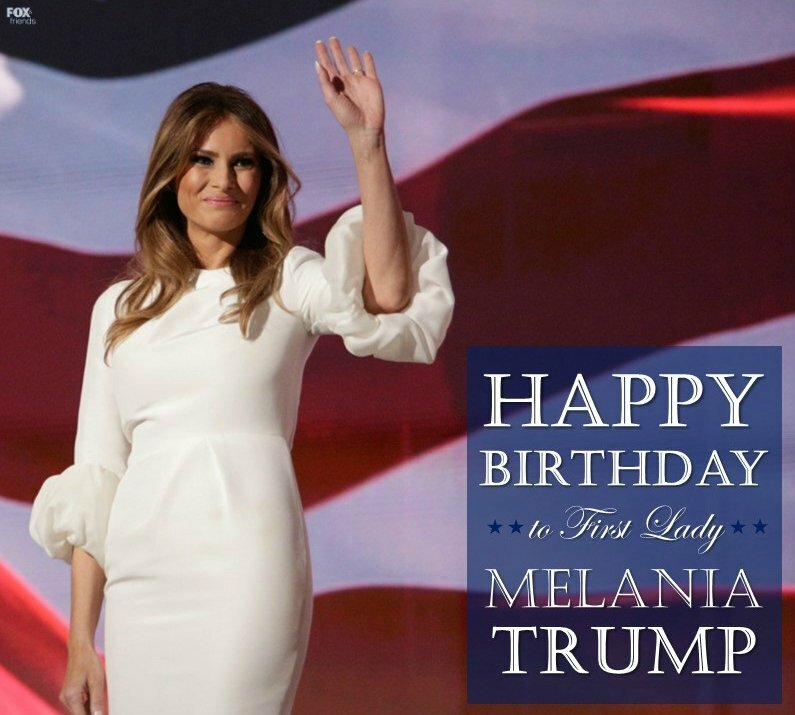 Happy Birthday, Melania Trump! Our First Lady. 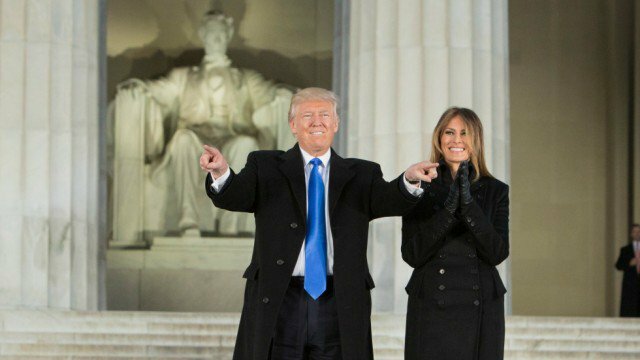 <> on January 20, 2017 in Washington, DC. 13 Responses to Happy Birthday, Melania! Happy Birthday to my Favorite First Lady ever. Happy birthday to our gracious first lady. Barron Trump has always reminded me of someone and I finally figured it out. 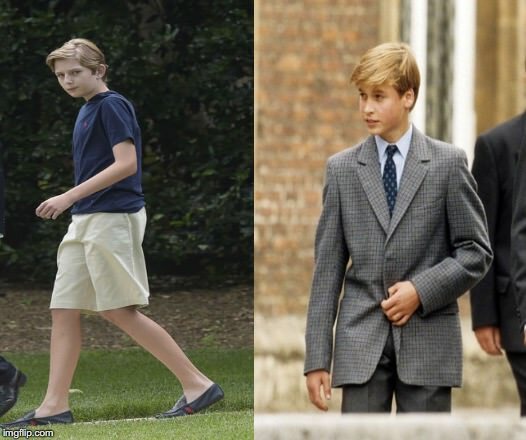 He carries himself like a young Prince William. Melania is a genius and understated tactical winner. Turns out….she had the State Dinner served on the Clinton China that the Clinton’s stole from the WH but had to return when caught with all the stuff they pilfered when Bush came in as POTUS. What a poke in the eye to the Shrillery and Company…..
ROCK ON, pretty FLOTUS….we adore you. I don’t know if that’s true. It is true that Clintons took things that weren’t theirs and returned some of them. It isn’t known if this china was the china that they took. I doubt it, actually, as it is china used for state dinners. I read that, and I read previous coverage. This china service is not specifically identified as the china that was “stolen” by the Clintons. Sundance doesn’t know this any more than you or I do – he’s going by previous posts by other bloggers or tweets on Twitter. It is Michelle’s garden, but she couldn’t have planted this year’s lettuce. Finally I find a blog that mentions Melania’s birthday 🎂🎂🎂. I’ve been looking at Treehouse but nothing there 😢. & many happy returns! Thankful for a godly, poised, & elegant First Lady!